Engel was already producing knitted nappies in the 1960s from bleached cotton. By using untreated cotton in 1982 the company started to concentrate on natural textiles in an exemplary and consistent way. 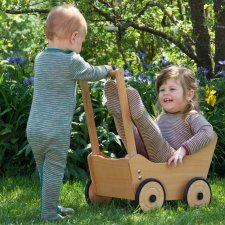 Today our range contains a complete underwear for babies, children and adults, a nightwear assortment for children and babies, baby outerwear. Besides organic cotton we use the finest organic Merino virgin wool and natural organic Merino virgin wool with silk. All the dyestuffs we use are free from heavy metals and have always been free from harmful AZO-dyes. 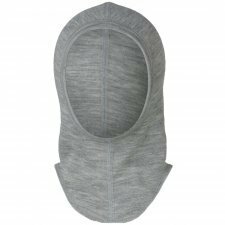 Baby balaclava made of 70% organic virgin wool and 30% silk. Fine rib. 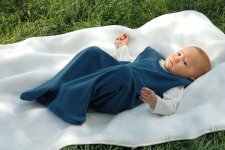 Baby envelope-neck roomper with feet, long sleeved, made of 70% organic virgin wool and 30% silk, fine rib. Poppers on legs. Colours: light grey mélange/turquoise or light grey mélange/orchid. Warm leggings made of 70% organic wool and 30% silk. Fine rib. 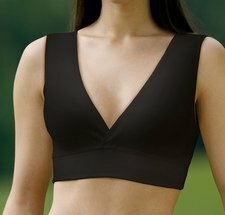 Nursing wrap bra, highly elastic for gentle hold, wide underbust hem seamless without hooks closure. Very comfortable and practical especially for the night. Made from 98% organic cotton and 8% elastane. 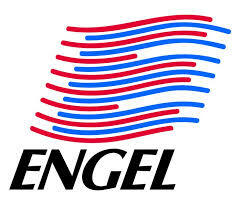 Made in Germany by Engel. Very soft blankets made from 100% organic fleece wool. Available colours: natural white, navy or grey. Price can vary depending on color. Cardigan made of 70% organic virgin wool and silk. Fine rib. With mother of pearl buttons. Available in light grey mélange, azur or salmon. Available in cherry red or light grey mélange. Men's boxer soft and comfortable, made of 100% ribbed organic cotton. Men's brief, mid rise, made of 100% ribbed organic cotton. Mid rise pattern. Short sleeve vest made of 100% ribbed organic cotton. Sleeveless vest wide shoulder made of 100% ribbed organic cotton. Ladies pants in silk and wool, perfect for keeping your back warm on the coldest days. Composition: 70% organic wool and 30% silk. Colours: natural white or black. Warm leggings made of 100% organic virgin wool. 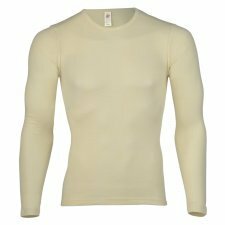 Long sleeve underwear shirt very warm, soft and breathable, with envelope neck. Ideal for children who sweat a lot. Made of 70% pure oranic virgin wool and 30% silk. 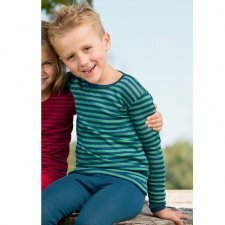 Long sleeve shirt made of 100% organic merinos wool. Mashine washable! Available colors: turquoise or blue. Long sleeve shirt made of 100% organic merinos wool. 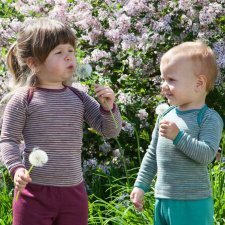 Baby envelope-neck vests, long sleeved, made of 70% organic virgin wool and 30% silk, fine rib. 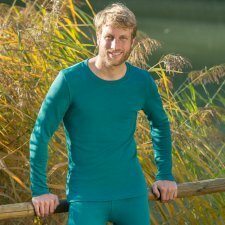 Long sleeve underwear T very warm, soft and breathable. Ideal for children who sweat a lot. Made of 70% organic wool and 30% silk. Prices range depending on the size and color. Long sleeve vest, made of 70% organic wool and 30% silk. Prices vary depending on the size and color.